Greyfriars' Church in Edinburgh has a number of strong associations with the Covenanters. The National Covenant was signed here for the first time in 1638. 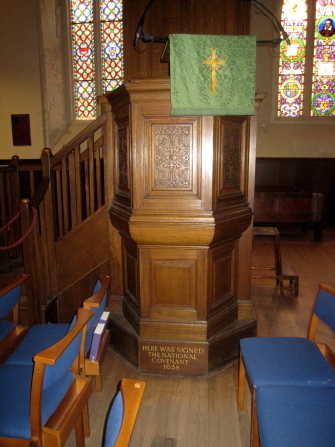 An inscription atthe base of the pulpit commemorates the event. Greyfriars' Kirk is regularly open to the public. Within it can be seen the inscription marking the spot where the National Covenant was signed in 1638. The church also has a small museum of relics associated with the Covenanters. There are also some Covenanter Flags on display.